What is a retreat anyway? A Passionist retreat is the gift of time and space to relax and refresh one’s spirit. A retreat provides opportunities for reflection, prayer, and renewal of heart in relationship with God. 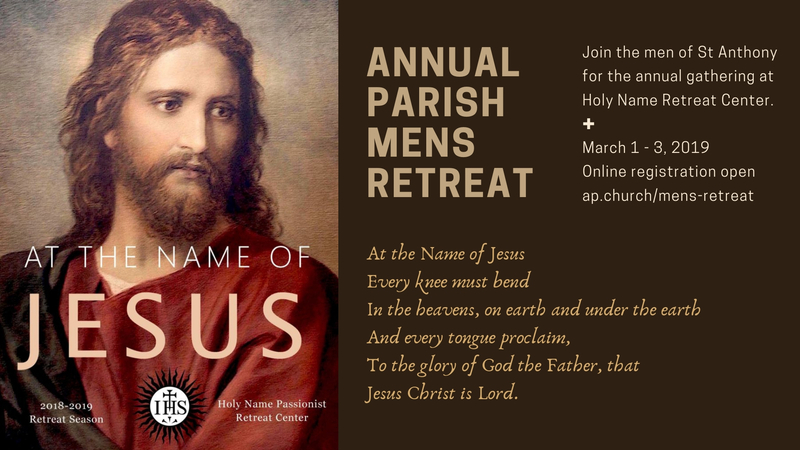 Retreats at Holy Name Passionist Retreat Center are for a full weekend, beginning with dinner Friday evening and ending Sunday afternoon following 11:15 mass. The retreat team offers a balance of free, unscheduled time with scheduled presentations or conferences. What if I have to cancel? Will I get a refund? Refunds (less the deposit) are given only if you call and cancel by 12:00 PM on the Wednesday before your retreat. No refunds are made for “no shows”. Please contact us as soon as possible if you need to cancel your retreat reservation. We often have a waiting list and this will help us to accommodate others who may wish to attend the retreat. If you have already paid your deposit and are able to attend another retreat during the current season, we can reserve a space for you on that retreat. What if I don’t want to go to one of the conferences? That’s ok. All we ask is that you arrive for the retreat on time and stay for the entire retreat weekend. The Congregation of the Passion are a religious group of Catholic priests and brothers and lay partners who have a special devotion to the love God shows humanity through the suffering, death, and resurrection (collectively known as the Passion) of Jesus Christ. Please take time to explore the entire Passionist website to learn more about us! Retreats are open to Catholics and non-Catholics. The prayer and worship styles are Catholic, because that’s who we are, but all are welcome! Do I have to be silent the whole time? Not the whole time. The bedroom areas and Chapel are designated “Quiet Zones,” and there may be times during the retreat when the retreat team calls the house to silence. Usually, retreatants spend time in conversation outdoors and during meals. Will it be like the retreats I attended as a youth? The weekend retreats offered at Holy Name Passionist Retreat Center are different than most youth retreats. There is less emphasis on group sharing and community building and more emphasis on fostering each individual’s relationship with God. What kind of clothes and items should I pack? Please dress comfortably but with a spirit of respect for the spiritual nature of our facility. Also, bring your favorite crucifix from home, ideally one you can hold in your hand, for a special blessing during Sunday mass. A selection of crucifixes will be available for sale at the retreat center. Your Crucifix will not only serve as a ‘souvenir’ of the retreat but – according to an age-old privilege granted to Passionist retreats and missions – after it is blessed at the conclusion of the retreat, a Plenary Indulgence is granted to those who reverence the Crucifix on their death bed. What time can I arrive for my retreat? Retreatant rooms are available after 4:00 pm on the day Friday of your retreat. The weekend retreat begins with dinner at 6:00 pm on Friday and concludes following 11:15 am Mass on Sunday. 7:00 p.m. Keeping A Grateful Memory of the Passion: Why and How? Jesus, you invited the apostles to come away with you to a deserted place and rest a while. Like your apostles, enable me to experience You on retreat — your suffering love and tender compassion. May I come to better know myself, to draw closer to you, and to thus be of better service to my brothers and sisters in the Church. Help me to listen attentively, to ponder prayerfully, to respond generously, and to benefit from the solitude and peace. Through the intercession of Mary, Mother of Sorrows, may I and my fellow retreatants leave our retreat as deeply committed Christians, better able to follow Your footsteps in all the opportunities and challenges of life. Amen.